Good architects can sometimes be hard to find. When you’re looking to build your house from scratch or simply do some alterations for your home to be more efficient like other modern houses then you’re going to need the help a professional. 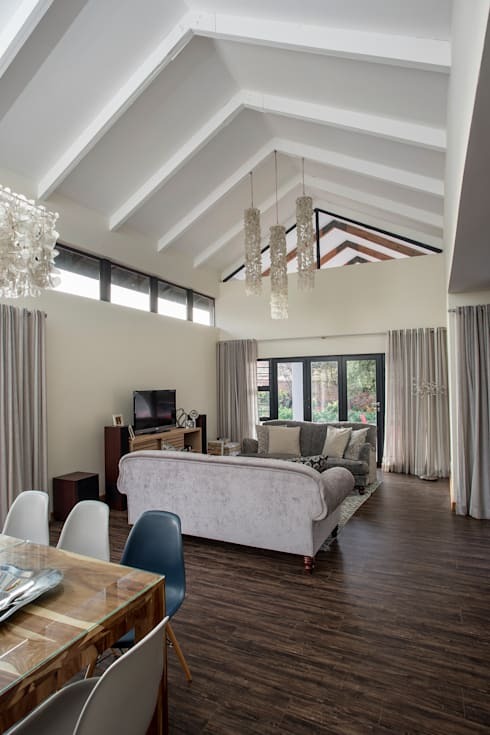 Houses in Sandton Johannesburg are known for their opulence and luxury and this is what Francois Marais Architects specialize in. While looking to improve your home’s functionality and design, keeping abreast with the best eco-friendly practices is a good investment. Today’s homes are leaning more towards energy and water saving aspects as well as becoming more practical and comfortable for its residents. Francois is dedicated to sustainability and designing homes in Johannesburg that are as efficient as possible. Their services include architecture and interior design and they cater for commercial and residential needs. In this ideabook we explore another successful project by these talented design and architecture company. This room was cleverly designed to harness the feeling of a large, luxurious space. The full-length drapes and Edwardian inspired couches, adds to that “royal” feel. The tall ceilings set the space for those beautiful chandeliers flowing down to light up the area at night. Wooden flooring is always a great idea to add a sense of modern charm that complements the rest of the accessories and accents within the living space. 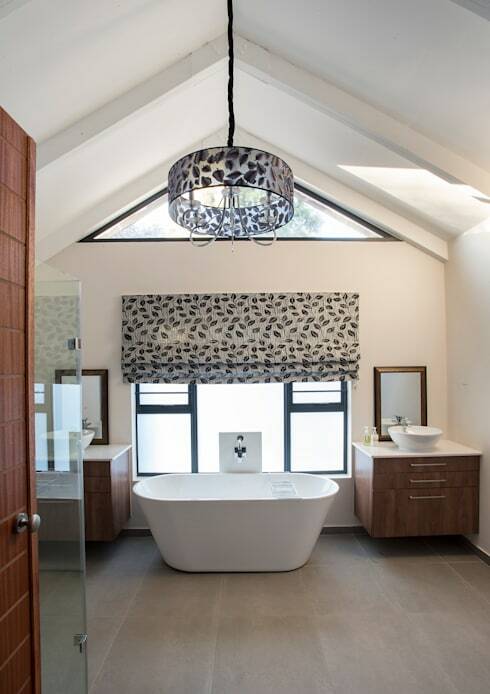 The team at Francois Marais Architects developed this bathroom into a stunning and modern retreat. The large freestanding bathtub allows the homeowners to relax and unwind from their busy day. Time is made efficient with his and hers basins, each with their individual storage cupboards creating more functionality. The large window also brings the natural light in from the outside reducing the need to switch the light on too early. By using these natural colours and wooden finishes, this bathroom displays an almost spa-like environment. 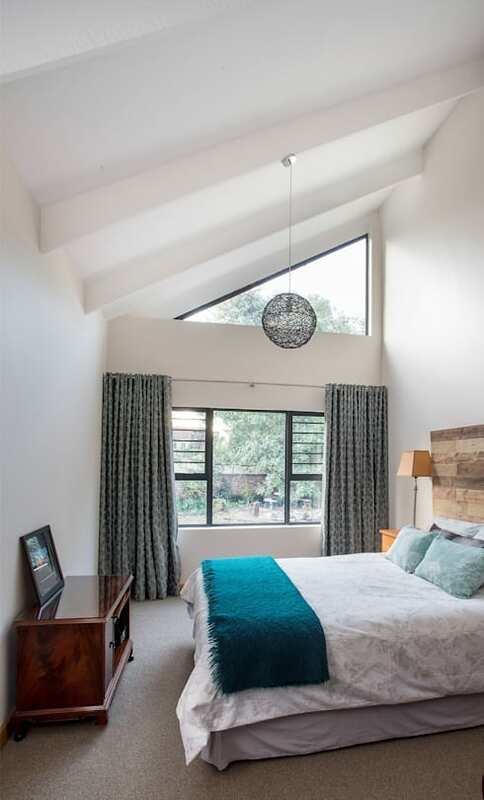 This master minimalist bedroom in Johannesburg is very rustic and comfortable. It has a unique light feature cascading from the tall ceiling and the extra window allows for more light that is natural. This room isn’t very large but the designers made full use of the space without any cluttering feel to it. Modern houses are designed for long-term efficiency, and while we are all looking to improve our lifestyles, improving sustainability at home adds to these efforts. Working with a interior design team will allow you to create the most efficient home which will save you money in the long run. Does this article excite you to bring change to your home with inspiration from homify?